Lewis Dunn crosses the ball in the match against Abbey Vale. Edusport Academy are the winners of this seasons South of Scotland League after beating St Cuthbert Wanderers by five goals to nil last Saturday at Galabank. They will now be promoted via the pyramid system and will play their football in the Lowland League next season. Long time leaders Wigtown and Bladnoch have to be content with second place after beating Abbey Vale by the odd goal in three at Trammondford Park. The home side though went behind to a Keiran Pirrie goal before fighting back to score twice to take the three points. 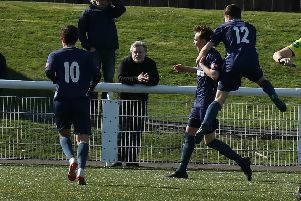 A Ross Landers goal was enough for Creetown to take a share of the points in their match against Mid Annandale while Nithsdale Wanderers and Threave Rovers shared the same scoreline at Sanquhar. Lewis West was on target for the home side with Ally Barnes finding the net for Threave.